Bethany and her boyfriend were driving home from her aunt’s house in Michigan. It had been a long and eventful trip, so natural Bethany was feeling a little tired. She therefore did what a lot of people reading this article will have done in the past at some point. She stretched out her legs and put them up on the dashboard. While her boyfriend was driving home, Bethany decided to have some time to sit back and relax. What Bethany didn’t realise at the time is that she would live to regret that. The events that happened next changed her life completely. While Bethany was sleeping a small vehicle collided with a motorbike. Luckily it wasn’t the 2002 Pontiac Sunfire Bethany and her partner was in. But unfortunately for Bethany, it set off a chain reaction. The truck driver in front of Bethany slammed on his breaks to avoid hitting the accident. However, Bethany’s boyfriend didn’t have enough time to stop and re-ended the truck. Luckily for Bethany, her boyfriend was able to move the car slightly to have her legs from being crushed on impact. The motorcyclist who’s accident set off a chain of other accidents sadly passed away. Bethany’s boyfriend had to get 100 stitches, but when Bethany woke up, she didn’t have such a lucky escape as her boyfriend. 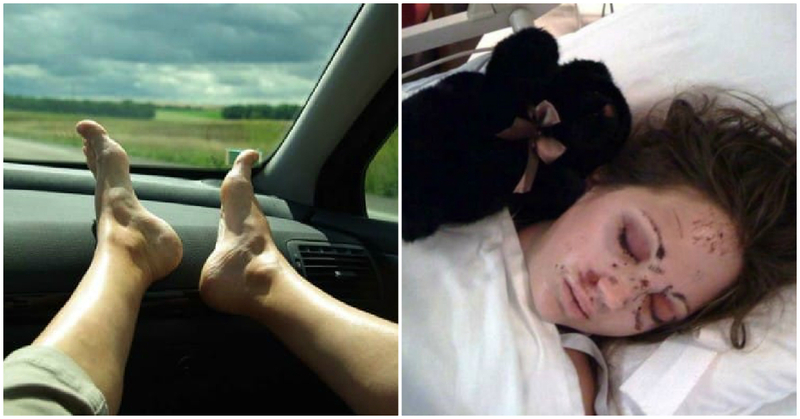 When she woke up in the hospital she discovered that both bones in her legs were broken as a result of putting her feet up on the dashboard. But why? Well, on impact with the truck, the airbags went off and pushed her knees right into her face. This left Bethany with a broken eye socket, nose, and cheekbones. It’s hard to imagine the amount of pain she must have endured. Bethany has no recollection of the car crash, however, she lives with the after effects every day as she’s taking PTSD injections to help with the mental trauma, as well as taking 20 tablets a day to cope with the pain of the crash. All because she put her feet up on the dashboard. Please share with your friends and family to warn them of the dangers of putting your feet up on the dashboard while in a moving car.